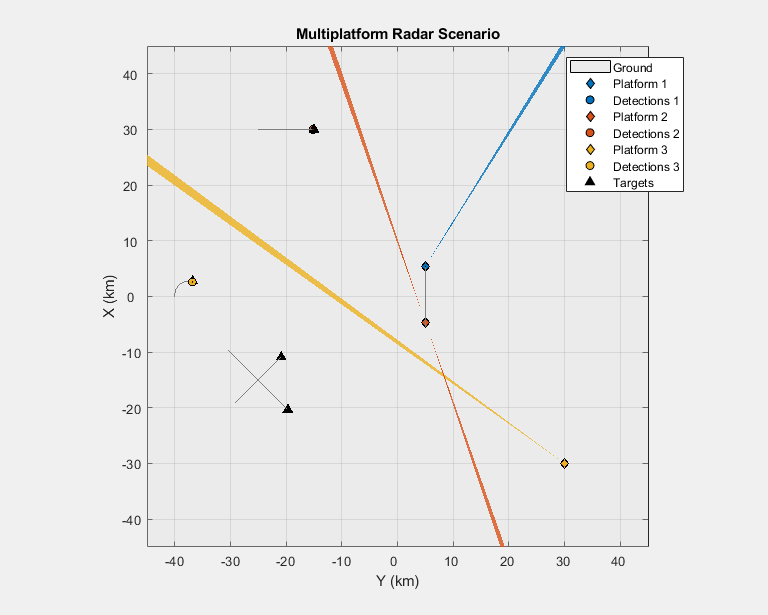 This example shows how to generate radar detections from a multiplatform radar network. The network includes three long-range platforms: two airborne and one ground-based. Such synthetic data can be used to test the performance of tracking architectures for different target types and maneuvers. The radar platforms and targets are modeled in the scenario as platforms. Simulation of the motion of the platforms in the scenario is managed by trackingScenario. % Add path to helper files used by this example. % Remove path to helper files when 'cleanPath' variable is cleared or deleted. % Create a tracking scenario to manage the movement of the platforms. Add an airborne platform to the scenario traveling north at 650 km/hr at a cruising altitude of 10 km. Generate the platform trajectory from waypoints using waypointTrajectory. % Create the airborne platform with its trajectory. Model the mechanically rotating radar using the monostaticRadarSensor. % Attach the radar to its airborne platform. Add a second airborne platform to the scenario traveling south at 550 km/hr at a cruising altitude of 8 km. Model the linear phased array radar using the monostaticRadarSensor. % Create right facing radar by setting radar's yaw to 90 degrees. % Create an identical radar looking over the left side of the airframe. % Attach the two linear radar arrays to the airborne platform. Add a ground-based radar using a rectangular phased array mounted 5 meters above its trailer. The radar electronically surveys a 60 degree azimuth span and 20 degrees of elevation above the ground using an electronic raster scan pattern. Model the rectangular phased array radar using the monostaticRadarSensor. % Create an electronically scanning rectangular array radar. % Attach the rectangular radar array to the trailer platform. Add four airborne targets within the surveillance region. % Add airliner traveling northeast. % Add crossing airliner traveling southeast. 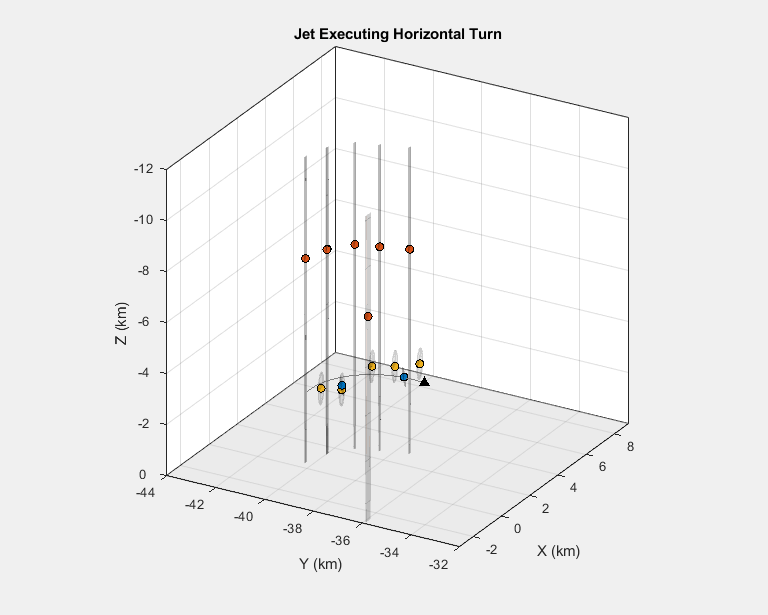 % Add jet turning with horizontal acceleration of 0.3 G.
The following loop advances the platform and target positions until the end of the scenario has been reached. For each step forward in the scenario, detections are generated from each platform and buffered. The trackingScenario must advance at a fixed time interval. Set the UpdateRate for the scenario so that the time interval is the greatest common denominator (GCD) of all of the update intervals associated with the radars' update rates. The commonUpdateRate supporting function finds the update interval common to all radars in this scenario. % Create a display to show the true and measured positions of the detected targets and platforms. % Show 3D view of the scenario. % Get current simulation time. % Generate detections from radars on each platform. % Generate detections from the platform's radars. % Buffer detections and configurations from this platform's radars. % Update display with current beam positions and detections. % Log sensor data and ground truth. % Save scenario and detections. Notice the large fan beams from the airborne platforms and the narrow pencil beam from the ground-based radar executing a raster scan. The ground truth trajectories are better visualized in a 2D projection. Notice the four targets represented by the triangles. 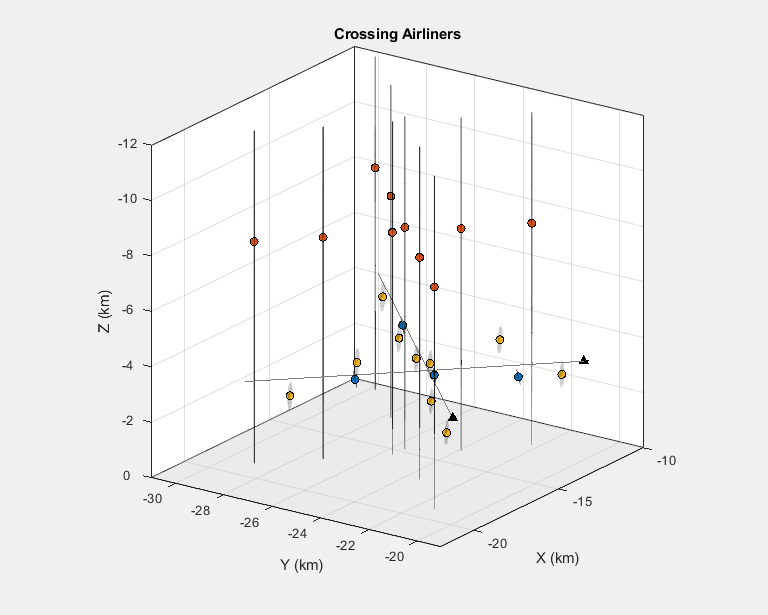 Around 30 km on the x-axis is the airliner traveling east (left to right). Around 2 km on the x-axis is the jet executing a turn clockwise. Further south are two crossing airliners. 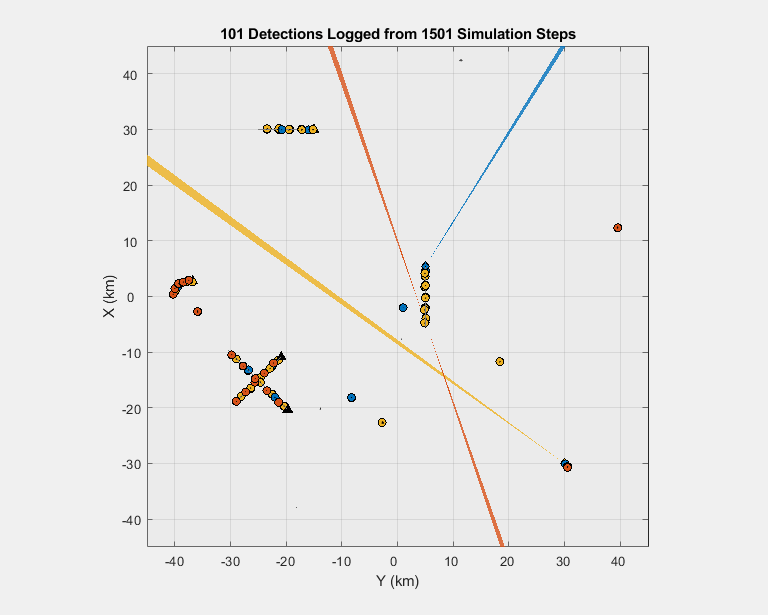 Plot the logged detections with their measurement uncertainties. Each color corresponds to the platform generating the detections. The legend from the previous display applies to all plots in the following analysis. For brevity, this legend is not repeated. Notice that the radars generate false alarms. These are the detections in the following plot that do not lie near any of the target trajectories. The 3D view in the following plot shows how these detections are distributed in elevation. 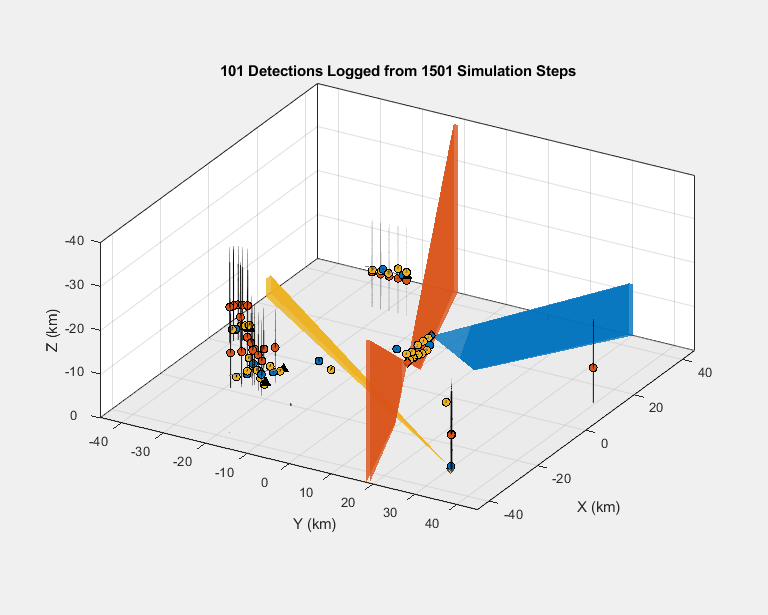 For platforms with 3D sensors (the blue and yellow platforms), the detections closely follow the target trajectories. The 2D platform's detections (the red platform) are offset in elevation from the target trajectories because its radar is unable to measure elevation. The 1-sigma measurement uncertainty is shown for each detection as a gray ellipsoid centered on its detection's measured target position (shown as filled circles). Zoom in on the jet executing the 90 degree horizontal turn. The 1-sigma measurement uncertainty is reported by the radar according to the radar's resolution and the signal-to-noise ratio (SNR) for each detection. Targets at longer ranges or with smaller SNR values will have larger measurement uncertainties than targets at closer ranges, which will have smaller resolution bin sizes and larger SNR values. Notice that the blue detections have smaller measurement uncertainties than the yellow detections. This is because the blue detections originate from the airborne platform (Platform 1) that is much closer to the target than the ground-based platform (Platform 3), which generated the yellow detections. 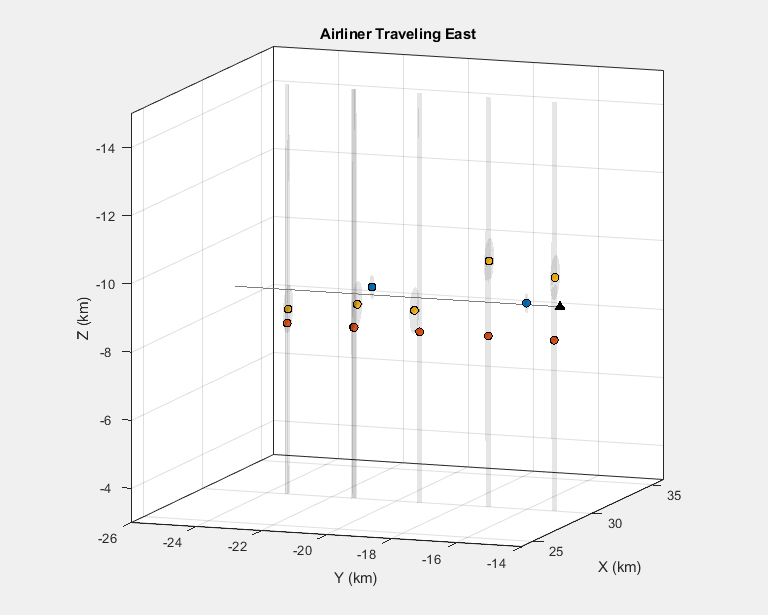 Notice the large uncertainty in elevation for the red detections coming from the airborne platform that uses two linear arrays to detect targets over the left and right sides of the aircraft (Platform 2). The ellipsoids have small axes corresponding to the range and azimuth dimensions of the radar but have very large axes along the radar's elevation dimension. This is because the linear arrays on this platform are unable to provide estimates in elevation. In this case, the platform's radar reports detections at 0 degrees with an uncertainty in elevation corresponding to the elevation field of view of the radar. Zoom in on the two crossing airliners. Notice that the blue airborne radar with the rotating array generates the fewest number of detections (only 4 detections for these two targets), but these detections are the most precise (smallest ellipses). The small number of detections from this platform is due to its radar's 360 mechanical scan, which limits how frequently its beam can revisit a target in the scenario. The other platforms have radars which scan smaller regions, allowing them to revisit the targets at a higher rate. Zoom in on the airliner traveling east. Same observations on the relative number of detections and accuracy from the different radar platforms applies. 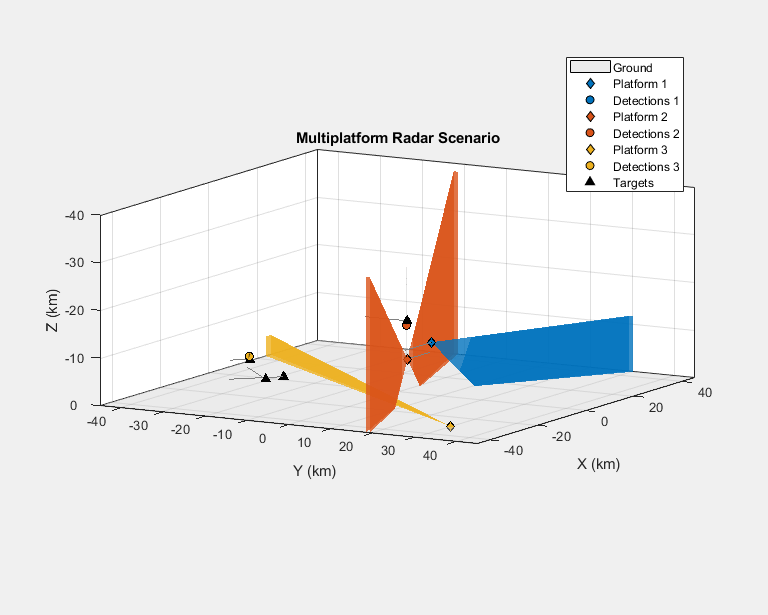 This example shows how to model a radar surveillance network and simulate detections generated by multiple airborne and ground-based radar platforms. In this example, you learned how to define scenarios, including targets and platforms that can be stationary or in motion. You also learned how to visualize the ground truth trajectories, sensor beams, detections, and associated measurement uncertainties. You can process this synthetic data through your tracking and fusion algorithms to assess their performance for this scenario. You can also modify this example to exercise your multi-target tracker against different target types and maneuvers. % Remove path to helper files used by this example. This function finds a common update rate across all of the sensors attached to each platform in the platforms cell array. trackingScenario must advanced at a fixed time interval. This function provides a sampling interval that is common to all of the sensors modeled in the scenario. This function logs the ground truth and sensor data of the scenario.